E.P. Shelky is a Hopwood Award recipient and optioned screenwriter releasing his debut novel. He has lived (and commuted) all over the streets of Los Angeles. Scooby is asked to do something most can’t imagine during his initiation into The Lords Latino. He justifies it as necessary to protect his sister, but is it? What would you do in his situation? To what lengths would you go in order to protect a family member? The desire for more money is fairly universal, but studies show that it’s not really connected to greater happiness past a certain point. How content do you think Tom Milford is? Does he like his life? Most importantly, would he evolve if not caught in Scooby’s initiation? Bad luck places Tom at the scene of the crime. Worse luck forces him to choose between saving someone he just met and fleeing for his life. Does he have a responsibility to Gwen when she’s trapped under the felled aisle? What should he have done? Related, from Gwen’s perspective, what should Tom have done when she was trapped in the bodega? How do you think she really feels about his actions? Scooby takes Sophía for a “feast” by stealing food in the grocery store. What role does food play throughout Streets of Gold? How does food and drink continue to show the characters state of mind? Tom meets with Detective Foley and learns that there are almost as many Lord Latino members as there are LAPD police officers. While the Lords aren’t based off of one specific gang, there are numerous gangs in LA that have as many (or more) members than this fictitious group. Given that law enforcement and gangs are often at odds, how do you think relative peace is maintained? What might happen if a gang decided to turn on the authorities? The use of technology and social networks to distribute information is a recurring theme in Streets of Gold. Google “100 days and 100 nights” for a recent example of gangs using instagram to communicate a very scary message. With the emergence of new apps like Periscope, how do you see technology continue to evolve in our social movements? What economic class do you think Gwen and her father are a part of? Of course, almost everyone is from a lower class than Tom, but do you think her decision to reengage Tom is influenced by their respective lots in life? How do these differences impact their Vicodin/ Scotch fueled evening together? The Belcher slowly reveals his master plan. On the surface it seems insane. However, just last week the mayor of Los Angeles had to cut a town hall meeting short because of a protest that started to grow unruly. There are countless examples of other protests to recent incidents, including the Bloods and Crips arranging a ceasefire surrounding the Freddie Graves shooting. In reality, how crazy is The Belcher’s plan? Many of the characters have animal nicknames. Foley later reveals he thinks of gang members as animals. Tom, however comes to the conclusion that we’re all just animals in a habit and will react to impulses (just like the ducks in MacAurthur Pond). Who has created or impacted the habitat in which you live? What are some of the impulses that cause you to react? Tom: What does his end say about the upper class? The Belcher/ Capone: What does this say about those hustling to move up? Detective Foley: How is his conclusion symbolic of the authority’s role in class warfare? Gwen/ Scooby/ Sophía: Is it a coincidence that the three characters who make it out unscathed are all the youngest? 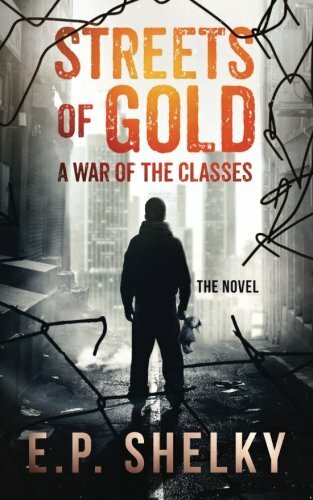 HAVEN'T READ STREETS OF GOLD. CLICK HERE TO BUY. Older PostA Tail of Two Books - The Publishing Industry on Fire?